You see, so far the only wild plant tea that I have had success in making is pine needle tea. So adding blueberries to it would seem logical. Never the less, I have been drawn to the idea for some time now and decided that this morning I would try it. Fist I went outside and grabbed some fresh pine needles. I live in Carolina so we have long needles that work quite well. Pine needle tea has a citrus flavor, it's easy to make, and is good for you. Remember that the next time you are in the woods. I cut the long needles into two parts and put them in a pot of water. Once everything came to a boil I dropped the temp down and let it steep. I then crushed the blueberries in my steeping pot, filled it will boiling water, and let it steep. Since the berries are a good part water I didn't think I needed to steep them under heat for a longer period of time. I let the pine needles go for about 15 minutes and then mixed them together. 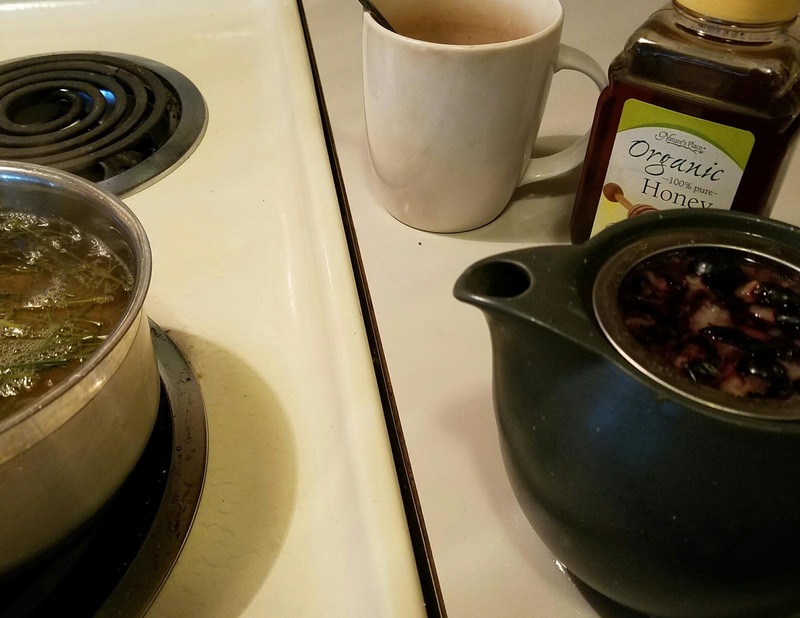 In honor of my friend John's newest hobby I decided to sweeten the tea with honey. In the end, the tea came out awesome. A slight citrus flavor with pine needle vitamin C along with and the antioxidant punch of blueberries.